I grin a little everything some new gadget comes out for making good coffee in the backcountry. As with many things, the original method is still the best, and in this particular case has the added benefit of requiring no equipment at all, aside from the pot, stove or fire, and ground coffee you already have. 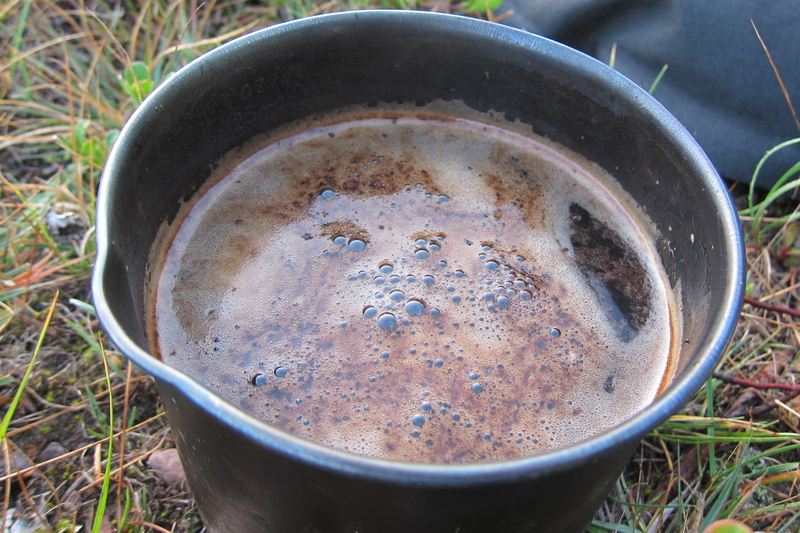 Like pitching a tarp so you’ll stay dry in a storm, digging a cathole, gutting a fish, navigating off-trail, or building a fire after an all-day rain, making cowboy coffee may seem intimidating at first, but is actually quite simple. Unlike those other things, you can get 90% of the way from cowboy coffee newb to expert without leaving your house. It’s a skill that, given coffees performance enhancing qualities, should be considered as essential as knowing to piss downwind. First start with a generous amount of grounds and some cold water. As many wise folks have said, you don’t need nearly as much water to make coffee as most people think. Fine grounds are advantageous when making cowboy coffee, they saturate faster and easier, which is the key to their reliably sinking. I bring espresso ground beans, but there is nothing wrong with turkish either. Combine grounds and cold water and set it to boil. You want to give the grounds as long as possible to saturate and get heavy, as well as impart good flavor to the liquid. Bring to a roiling boil, and keep it there for 10-15 seconds. On most camp stoves doing this without boiling over will require a less than full pot, as well as hovering the pot over the burner using a grip, pliers, or a glove/sock. Let the pot rest for a minute. There are many ways, like adding a squirt of cold water or tapping the edge, to help the grounds settle, but if you’ve done the above and have a bit of patience this issue should take care of itself. Drink. You can decant from the pot into mugs/cups/bottles, or drink straight from the pot. Obviously, don’t swirl or otherwise seriously disturb the coffee, or attempt to pour or drink the last few ounces at the bottom. This is the best, and simplest, and lightest, way to get a solid cup of coffee in the backcountry. And often a good way to impress friends and neighbors. Practice a bit at home, and you’ll be set to go. Agreed! My wife and I used all the common methods on the PCT this summer but we quickly settled on cowboy coffee. The taste beats VIA/Instant/coffee bags by a long shot and there’s no garbage to pack out. As mentioned, a very fine grind is the key to having the beans sink before the coffee is cold. Grind your own beans before you go. Pre-ground beans will typically be too coarse and less tasty. Huh. I’ve never had much luck with cowboy coffee. But I’m a French press user at home, so I’ve always tried to make cowboy coffee with a coarse grind. I’ll have to give this a shot. Thanks for posting. Do you notice any difference in the coffee at high altitude? Your boiling point won’t be quite as high as mine. I normally grind my own beans and for this type of coffee, I grind as fine as I can with a spice grinder. I’ll run the coffee through a tea strainer and any grounds that pass through are too fine to notice. I don’t really mind the grounds in the coffee, but they’re too hard to get out of my teeth. What mug is in the photo, DaveC? An old BPL 900ml pot. Yes, 6-700ml of strong brew is normal for me. – let the coffee settle keeping the pot in warm place but don’t let it boil! * The traditional ground for making-in-pot doffee around here is actually very coarse. I do get the point of fine grind. Makes sense. We call it cowboy coffee here, but my wife grew up making it this way, too. She still makes it occasionally at home in this way. Where she spent her childhood (Polish-German border prior to the fall of the Berlin Wall), having separate ‘gadgets’ for making coffee would have been a luxury where and when she grew up. It is just how coffee was made. Her method is very similar to korpijaakko’s above. -I’m not a fan of boiled coffee; I prefer to bring to boil, take off heat, then add the (finely ground) coffee. -I’m impatient and ready to drink, so I stir and pour into a melamine cup with the pot lid on which “filters” grounds sufficiently. I appreciate and approve of the enthusiasm and strong feelings on this subject. We must remember that caffeine is an addictive, psychoactive, performance-enhancing (WADA does not currently have a threshold, though it is on their “monitored” list of stimulants) drug which marvelously has no adverse health or social effects (unless used in truly vast quantities). Consensus seems to be that coffee ought to be brought to 200F (+/- 5F) for best results. Given that 200 is the boiling point at around 6000 feet, and the 5 degree margin of error encompasses the boiling point between 4000 and 9000 feet, we hikers appear to be in good shape. The length at which coffee should be held at said temp comes down to personal preference. I have a strong affinity for bitterness, so I go longer. If a triple espresso is not your normal mid-afternoon snack, as it is mine, you might want to boil only briefly or not at all. I will be doing this the next time I’m out hunting.